Imagine lawns of ours just emerging from night, flashing early lights from their dewdrops when all the stars have gone; bordered with flowers that just begin to appear, their gentle colours all coming back after night; untroden by any feet except the tiniest and wildest; shut off from the wind and the world by trees in whose fronds is still darkness: picture these waiting for the birds to sing; there is almost a hint there of the glow of the laws of Elfland; but then it passes so quickly that we can never be sure. Originally published in 1924, The King of Elfland’s Daughter is one of the grandfathers of modern fantasy. It tells the story of Alveric, the son of the Lord of Erl, who’s told by the parliament that his people desire to be ruled by magic. As a result, Alveric travels to Elfland to marry Lirazel, the King of Elfland’s daughter. But unlike what you might expect, this quest for the Elf Princess isn’t the whole story, but merely its beginning. Alveric and Lirazel come back fairly early in the book, and become the new rulers of the Kingdom of Erl. But like all the magical brides and bridegrooms of legend, Lirazel has trouble settling in. Dunsany writes with surprising sympathy about her longing for home, and portrays as much more than Alveric’s prize – and it’s only when the inevitable happens that the story truly begins. Dunsany mined a narrow vein, but it was all pure ore, and all his own. I have never seen any imitation of Dunsany that consisted of anything beyond a lot of elaborate made-up names, some vague descriptions of gorgeous cities and unmentionable dooms, and a great many sentences beginning with “And”. It’s possible that my knowledge that Dunsany was the first to write like this has something to do with my positive response to his work, but there’s also the fact that there really is a lot more to what he does that sentences beginning with “And”. The syntax is easy enough to mimic or to parody, but what he gets right (which, whatever it is, runs much deeper) absolutely isn’t. Part of what makes his formal, elevated, descriptive and somewhat meandering style so successful is the fact that it isn’t in the least gratuitous. On the contrary, it’s a fundamental part of what makes The King of Elfland’s Daughter what it is. Those who believe that fantasy is all about the plot and never about the writing itself are cordially invited to read this book. But what, you’re probably wondering, is The King of Elfland’s Daughter? It’s a story about the passing of time; about mortality; about what separates “the fields we know” from Elsewhere, from everything we don’t know. It’s a story about wonder and mystery and longing and the imagination, and about how they’re a fundamental part of what being human is all about. Whenever I write about fantasy, I do so from a place that is largely dominated by my desire to bridge the gap – to bring it closer to realistic fiction, to show that what it does is really not so different from what other books do. This is because I believe that the gap is much too wide; far wider than it needs to be. But on the other hand, there is something about fantasy that is distinctive, and, to fans like myself, distinctively appealing. The reason why I’ve yet to be able to write about this successfully is because I’ve yet to be able to properly explain to myself just what this distinctive quality is. But after reading a book like The King of Elfland’s Daughter, I feel that I almost can. Alveric’s desperate quest for Elfland, whose borders keep retreating, told me so much about what it means to be human. It told me about why we tell stories, why we have myths, why we dive into the deepest ocean abysses, why we have gone to the moon, why science exists, and history, and religion, and literature too. There’s something so human about his longing for something just out of reach. Alveric’s mad journey, one of the progenitors of the fantasy quest as we know it today, is at its core about a feeling we can recognise in so much of what we do. 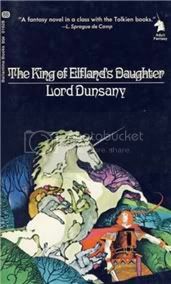 The King of Elfland’s Daughter is clearly part of the same tradition as books such as Hope Mirless’ Lud-in-the-Mist, John Crowley’s Little Big, or Neil Gaiman’s Stardust. It’s not that they’re similar, necessarily; it’s just that they seem to define Elfland in somewhat similar terms. Depending on what you love about these books, I think you could fall in love with Lord Dunsany too. Just approach him patiently, carefully, and try your best to forget everything you know about stereotypical fantasy prose. Dunsany can get away with it – he’s the real thing. http://normblog.typepad.com/normblog/2009/09/writers-choice-223-katherine-langrish.html - it's one of my most loved books. Short of Lewis & Tolkien, I've never read Fantasy. In fact, (true confession time here) I was at first hesitant to add you to my reader because I was afraid it would be full of too much fantasy. I'm glad I did because I found that our tastes are actually strangely similar. And perhaps where they differ is where I need to grow. So, back to the topic at hand, as you've described it, Lord Dunsany seems to be fantasy in its purest (maybe highest?) form. And so, before the year is out, I shall read this book. I start today in tracking it down. Thank, Nymeth, for doing what all of us should do & inspire others. I read and liked Little, Big and since this book is similar, I might want to try it. I loved Little, Big and have been hard pressed to find anything even remotely like it since I read it, so it's good to hear that there are some comparisons here. It sounds like Dunsany is a really descriptive and creative man, and though this book might not be for everyone, I think I'd like to give it a try! Thanks, Nymeth! While I've never read Stardust, I've always understood it to be an experiment in pre-Tolkien fantasy storytelling... which this certainly is, considering when it was published! Thank you for introducing me to Lord Dunsany- it sounds like he's quite a gap in my fantastical education. I've always had a problem when people just dismiss Fantasy as some fluffy thing, as escapism and nothing else. Fantasy is escapism but so is every other kind of fiction, including literature! They all take you to another place, someone else's life. If they're written well, they all make you forget your own troubles for a while. I can go on and on about Fantasy for ages! I studied it at uni and wrote my Honours dissertation on it. It's very easy to set me off! Sounds fascinating. Most of the fantasy I read is just YA fantasy, or fairy tales. I need to try some of this stuff you keep bringing up! I'm so glad you were able to tell me how to approach this book. I asked for it via interlibrary loan a several years ago and was only able to get halfway through. I had expected reading it to be as straightforward as opening a treasure chest. When it wasn't like that, I found it hard to pick up again. But, it looks like you're saying the second half is what shapes the story into a whole? For me, there are two main kinds of traditional fantasy writing. The first is the shifting, ephemeral image-filled kind: translations and adaptations of Le Morte d'Arthur, Charles Perrault, The Mabinogian, Andersen. The other is the earthy kind like Beowulf, the Prose Edda, The Ulster Cycle, Pilgrim's Progress, and Grimm. I think most authors who write high fantasy (or whose work has elements of it) slip most naturally into one mode or the other. Dunsany is clearly in the first bunch. I still like both kinds of fantasy, but over the years I have shifted a little in what sparks my imagination most strongly. I had such love affair with Le Morte d'Arthur in my teens, it's pretty hard for anything else to take me to the same place. I also think its harder to write successfully in the first mode, don't you? I had not known that Ursula Le Guin admired him. That's surprising. She is so firmly in my "earthy" category. The cover reminds me of the music video for Goldfrapp's Oooh La La. As usual you make me want to break out of my normal reading comfort zone and expand my horizons and read more fantasy! You always "bridge that gap" for me! I'll keep that in mind, Ana, should I read this book. I'll be patient and read it slowly. I'm not sure if I'd be overdose but I'll find out when I read it. :) That's sure one old book (1924!). Katherine Langrish, I so enjoyed your post! Needless to say, The Strange Adventures of Colonel Polders has been added to my list. Jenny: Yes, William Morris too. I hear his stuff is not exactly great, but I'd love to read him not only for historical reasons but because he was involved in that late Victorian/Edwardian cultural climate that I find so interesting. Jeane: Or maybe it's also that many fantasy authors reference him as an inspiration! Zibilee: I don't want to mislead you, so I have to stay that they're not exactly similar - but they DO seem to share a similar kind of sensibility and way of thinking about what faerie stands for, you know? Clare: Yes, that's definitely true about Stardust. And as much as I love Tolkien, I'm actually fonder of his tradition than of high fantasy. Amy: I honestly think that some of the best fantasy out there is YA, so it sounds like you've been reading some good stuff. Trapunto: I think that if I hadn't decided early on to simply take my time with it, I might have felt frustrated and given up too. The second half and the ending did bring things together, but it remains somewhat episodic - it's definitely more about the language and the little details than the plot. I agree with you about the two modes of fantasy, but to my surprise, Dunsany turned out to be difficult to place. And yes, Le Guin mentions repeatedly on The Language of the Night how much he influenced her - I wouldn't have guessed it either! She says in one of the essays she's actually glad that LOTR only came out when she was an adult, otherwise if might have shaped her imagination too much. Chris: Don't be scared! I honestly think you'll enjoy this. Just remember to take it slowly. Belle: I think they can work very well if done right - Pearl S. Buck is another author who pulls them off marvellously! Lua: I judge books by their covers all the time ;) I love the old-fashioned look of this one! Kathleen: Aww - I'm happy to hear it! Andreea: I'd actually recommend Lud-in-the-Mist by Hope Mirrless to you before this one. It's the exact kind of early twentieth-century novel that you tend to love, AND it's fantasy!